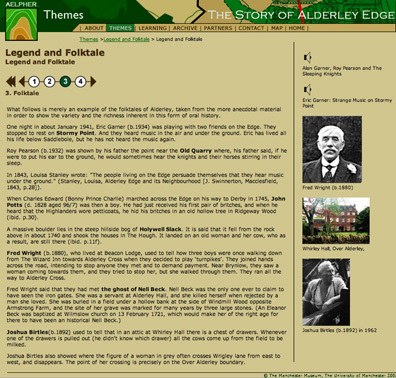 The Story of Alderley Edge by The Manchester Museum, University of Manchester. 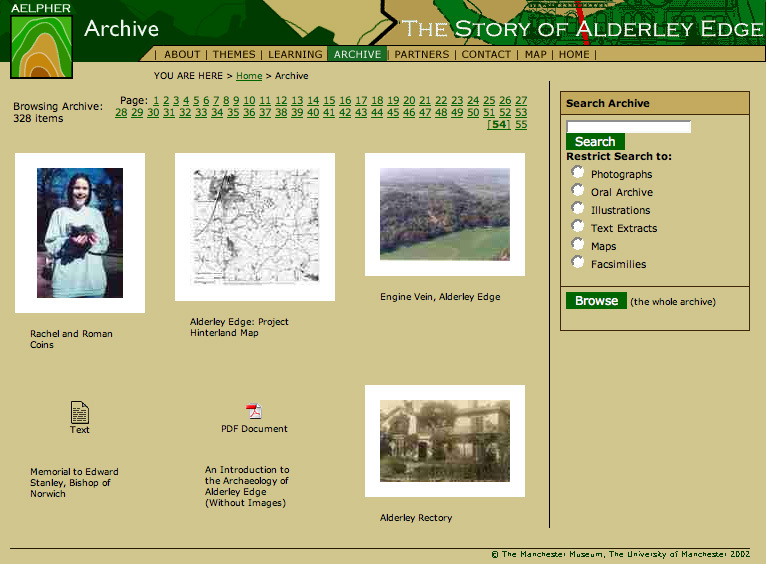 Website available: http://www.alderleyedge.man.ac.uk/.Viewed in Internet Explorer, Opera and Firefox and Konqueror. RealPlayer or Kaffeine required for audio files. Alderley Edge is an example of an archaeological site that defies easy categorisation or definition. An area of copper mining since the Early Bronze Age, it is the focus for the Alderley Edge Landscape Project. This collaboration between Manchester Museum and The National Trust has been given an extended life by providing heritage and educational resources through the website The story of Alderley Edge. The project behind the website is AELPHER (Alderley Edge Landscape Project: Heritage and Educational Resources). The AELPHER project is led by The Manchester Museum, with funding from the Heritage Lottery Fund, the Carnegie UK Trust, Manchester Airport Community Trust Fund, Macclesfield Borough Council, the Duchy of Lancaster Benevolent Fund and the Robert Clutterbuck Charitable Trust. Quite rightly, the original landscape project focused not only on the mines but on the whole landscape of the Edge, including its modern settlement, and this continues to be the focus of the website project. 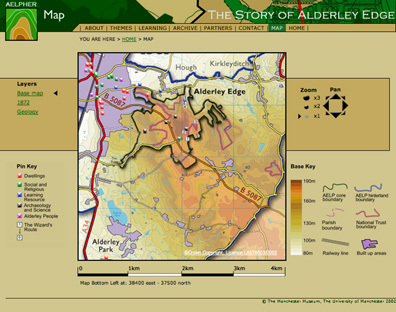 The website (http://www.alderleyedge.man.ac.uk/) is an attempt to draw together a large amount of different kinds of information relating to the Edge: its 'geology, mines, archaeology, plants and wildlife, geography, history, legends and literature'. 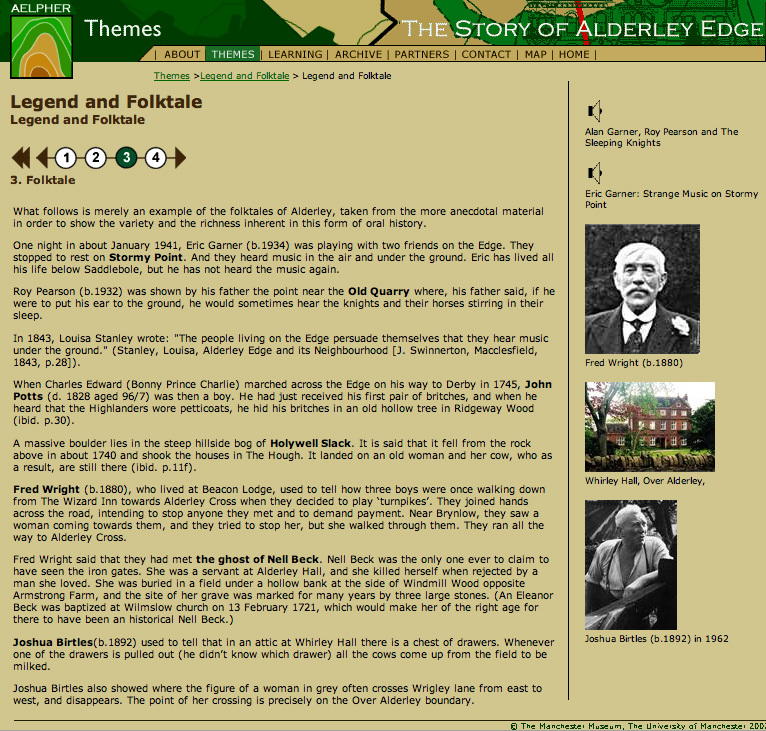 As the site also says, it will present 'the stories that make up Alderley Edge'. This is a welcome recognition that people do want narratives to help make sense of the world they live in. This goes against the grain for many archaeologists, whose training is in writing reports and analyses rather than the creation of stories. The home page is attractively designed yet clear. There are seven tabs to the rest of the site: About, Themes, Learning, Archive, Partners, Contact and Map. The About page is simple, telling viewers what they need to know, and contains appropriate warnings about the need to conserve the heritage of the Edge as well as a not very well sign-posted three-dimensional rotating model of the Edge landscape that opens as an .avi file. While this is a nice feature to have, the rotation is rather rapid and does not allow the viewer to control the rotation. In addition, there's no labelling to show where the modern or archaeological features are on the model. It is pleasing to look at, a nice little trick, but not really very informative. There is also a picture of an Early Bronze Age wooden shovel found at the site of the mines, along with a nice short poem about it. However, the thumbnail image of the shovel is quite small, and selecting the image takes you to the poem rather than an enlarged image, which would have been more useful. 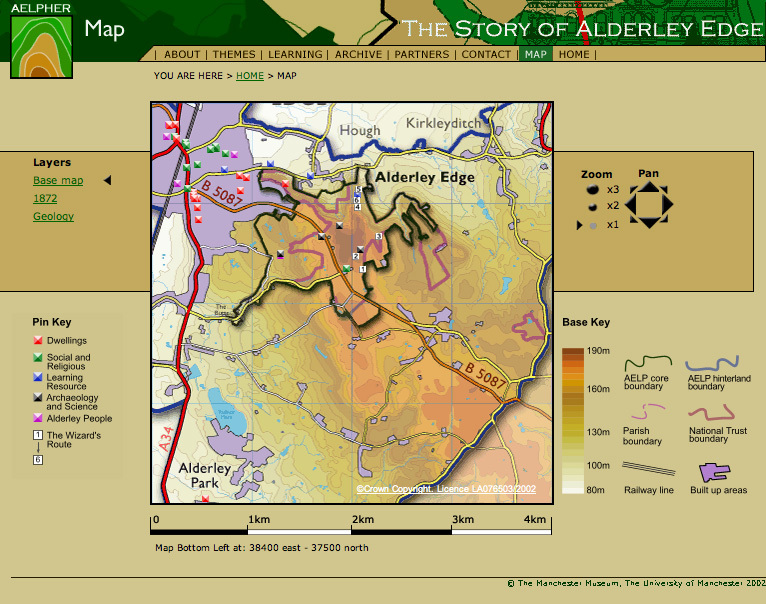 an introduction to the archaeology of Alderley Edge. Every theme includes a variety of topics, each of which can be explored separately. Each is presented as short texts, with accompanying pictures (photographs, annotated maps, extracts from original documents, which do enlarge when clicked), or oral recordings. Navigation from one page to the next within each topic is easy through a simple but attractive page indicator. The oral history selections required RealPlayer, which for me was unfortunate since this is not installed on my computer. The website is therefore mute for me, and I suspect will be for many other viewers. The inclusion of folktales and legend is welcome, since it is these that form such an important part of the intangible heritage and which give life to the places in the landscape and makes them meaningful for the people who live in it (Fig. 1). The historical map gallery is a fascinating set of pages with maps of different dates for the area, along with background information. For those who like maps (me included) this is a real treasure trove of information. Perhaps it is fair enough that the last of the themes is an introduction to the archaeology of the area, but even for an introduction it is rather short and tantalising, so viewers are unable to delve into the archaeology in any detail. For me, this was the most frustrating of the themes. I was expecting to find lots about the archaeology, but there was nothing to find. There is a little more in the shape of a .pdf file of the introduction to Professor Prag's book on the archaeology of Alderley Edge, but a determined reader would have to pay the £33 (P&P included) for a copy from the Manchester Museum to be able to find out more. It would have been good to have had rather more about the archaeology itself on the website. Not everyone will be willing to buy the book. The Archive section is where greater depth of information should be found, but while there is a wealth of material here, I found it disappointing as an archive. It seems to promise more than it delivers. The introductory text says that it contains archaeological, geological and natural history reports, along with GIS surveys carried out by the Alderley Edge Landscape Project. It also says that there is 'a catalogue of material held here and elsewhere, so that even if we do not have a particular source you can discover where it is kept'. From what I could find the archive is mostly photographs, drawings, extracts from documents, maps and oral history recordings (Fig. 2). I could not find any archaeological report, nor a GIS survey. The catalogue seemed especially elusive, unless what was meant was the ability to browse 55 pages of contents of the archive, with content in seemingly random order and pages numbered with no indication of content. The search facility seemed of most use if you knew exactly which item you wanted to find. Simply searching for material by categories like 'the bronze age' only threw up the photograph of the wooden shovel. I suspect the major aim of the website was to create a resource for local schools. The Learning section of the site is indeed very impressive. There is a scheme of work for each of years 5 to 8 (9/10 year-olds to 12/13 year-olds) covering English, history and geography. Each is based on a book in the Stone Book Quartet, by local author Alan Garner. Not only is Alan Garner a well-known writer of fiction for children, his books in this quartet are semi-autobiographical and based on his own family's memories and stories of life in the area. The books are linked to the resources on the website and the maps, pictures and reminiscences offered by the website are indeed a treasure trove of teaching resources. The website serves to link reading materials with audio and visual resources in an exciting way. There is also a virtual field trip linked to a map of the area. My only quibble here is that it would have been good to link the schemes of work with real field trips to accessible locations in and around the Edge. The advantage of making the schemes so dependent on the website for resources is that they are thereby accessible by schools anywhere. It does seem a shame though that an optional field element could not have been signposted for schools that could travel to the Edge and its landscape. Classroom learning in geography and history is only ever a poor substitute for learning in the environment. Another section is the Map (Fig. 3), which turns out to be one of the best features of the website. There are three base maps to chose from: topographical, geological or historical (1872). On each of these there are locations that can be selected to open an image or recording, with background information. There are three scales of zoom and the map can be panned across, up and down to cover a wider area than first appears. Superimposed on the map are various boundaries: National Trust land, parish boundaries, and the project core and hinterland boundaries. This can make for some degree of clutter in parts of the map and these might have been better as optional overlays rather than on the map by default. The clickable locations are colour-coded by type and offer a good way of exploring the area, and act as a resource for the schemes of work. The geology map could have been improved with some descriptions of the individual rock series, and one of the series on the map did not appear to be in the legend at the side. The topographical map has coloured contours, which make it attractive and easy to visualise. On the other hand, a plain contoured version in black and white would also be useful, especially for people with visual problems, such as colour-blindness, who might find the coloured version hard to see in detail. The Contact section of the website is very simple and merely gives an email address. It would have been good to have a higher profile invitation for materials from the community e.g. old photos, modern photos, comments, poems, etc. here. It would also be preferable to have named contacts, since some people may be more likely to get in touch with a real person than an impersonal email address. Overall, this is an ambitious website. It perhaps offers more than it actually delivers in places, but is a very welcome attempt at a holistic history and geography of a particular place. It is too easy to look at the archaeology of somewhere completely divorced from the human dimension of those who live in the area and have stories about it. It brings the archaeological landscape together with modern experiences and geography. It also gives teachers an excellent educational resource and links three subjects that ought to be linked far more often in an interesting and stimulating way. Too many websites suffer from being too wordy and read like a written publication on screen. This is not one of them. It makes good use of the technology and is visually attractive, easy to navigate and contains a restrained used of audio-visual 'firework' that is good to see. It is not perfect, and I have noted things that left me disappointed or things that could have been done better. Nevertheless, it is interesting, useful, refreshing and a site that others could profitably look at.